The Juliet tomato is sometimes described as a mini Roma tomato, because of it's unusual elongated shape. It's also called a "grape" or "cherry" tomato. It is a high yield producer that grows in clusters of 10 to 18 fruits. The Juliet is specially noted for its crack resistance and high yields. The Juliet hybrid tomato is a past winner of the prestigious All America Selections Award. It grows glossy red, tasty sweet, 1-ounce fruits. Cracking can be a problem for other grape tomatoes, but not the Juliet variety; therefore, it clings to the vine well even when ripe. It also has good disease resistance. 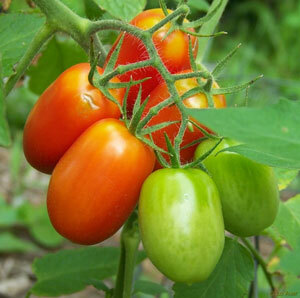 Grape tomatoes have a higher sugar content than many cherry tomatoes, which has led to their growing popularity. The most commonly available variety in stores is the Santa, but its seeds are not as available as the Juliet's. Tomatoes are easy to grow from seed indoors but should be planted outdoors after all danger of frost has passed. Guidance on safe planting dates can be found in When to Plant Tomatoes.